THE INTERNATIONAL BROTHERHOOD of Boilermakers is mourning the death of Abraham “Abe” Breehey, 34, who passed away April 14 at a Falls Church, Va., hospital from a recently discovered brain tumor and a subsequent stroke. 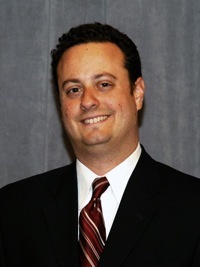 Abe joined the Boilermakers in 2004 and at the time of his death served as Director of Legislative Affairs and Special Assistant to the International President. He was an accomplished advocate for the Brotherhood in the halls of Congress, where he became well known and highly respected for his passion, his intellect, and his extraordinary ability to build lasting friendships and forge consensus. As part of his work, Abe testified before Senate committees and lobbied lawmakers on behalf of Boilermakers employed across various industries. He represented our union in international negotiations regarding the United Nations Framework Convention on Climate Change. He also advised the AFL-CIO Building and Construction Trades Department as chairman of the department’s Legislative Task Force. Upon learning of Abe’s death, members of Congress read statements into the Congressional Record praising his life and his work. They included Sen. Barbara Boxer (CA), Rep. Joe Courtney (CT), Rep. George Miller (CA), Rep. Brian Higgins (NY), Rep. Mazie Hirono (HI), Rep. Sam Farr (CA), Rep. Thaddeus G. McCotter (MI), and Rep. Linda T. Sánchez (CA). Two other lawmakers, Rep. Lloyd Doggett (TX) and Rep. Betty Sutton (OH), arranged for flags to be flown over the U.S. Capitol. The flags were later presented to Abe’s family. 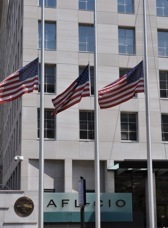 Flags were lowered to half-mast at AFL-CIO headquarters (above) to recognize Abe Breehey. Flags were also flown over the U.S. Capitol in his honor and were presented to family members. Meanwhile, flags at AFL-CIO headquarters in Washington, D.C. were flown at half mast in Abe’s memory. Bridget Martin, Director of Political Affairs/SAIP, who worked with Abe in the Department of Government Affairs, said “Abe was an extraordinary colleague and friend. In Abe we saw the qualities that the labor movement needs in this time of crisis — principles, compassion, and determination. He was open-minded, thoughtful, yet resolute in his beliefs. He had that rare gift to connect and unite people, and to see beyond differences to find common ground. If Abe agreed with a position or a strategy, it had a future. If he didn't, he suggested a way to make it work. The enduring memory of his cheerfulness and intelligence will inspire us to carry on no matter what obstacles we find in our path. Abe was, in the words of Joe Hill, a ‘don't mourn, organize,’ kind of guy." Abe received his bachelor’s degree from Sienna College in Loudonville, N.Y., and his master’s degree in Public Policy from the Rockefeller College of Public Affairs and Policy at the University of Albany. He was also a graduate of the Trade Union Program at Harvard Law School. Prior to joining the Boilermakers, he served as legislative assistant for Rep. Doggett. He is survived by his wife, Sonya (Walter) Breehey, daughter Abigail, parents Ray and Carol Breehey, sister Rachel Breehey Mollen, three nieces, and a nephew. For Wired Donations please contact the bank at treasuryservices@bankoflabor.com for additional information. To view statements that were read into the Congressional Record on behalf of Abe Breehey, click on the names below. Mr. President, it is with deep sadness that I pay tribute to Abraham ‘‘Abe’’ Breehey, and I ask my colleagues to join me today in honoring his memory. Abe, who was a champion of the rights of America’s working men and women, passed away suddenly last month from complications related to a brain tumor. He was just 34 years old. Abe was a well-respected friend and colleague to many in the Senate. As director of Legislative Affairs and special assistant to the international president of the International Brotherhood of Boilermakers, Iron Ship Builders, Blacksmiths, Forgers and Helpers, he tirelessly represented workers across the country. He also served as chairman of the AFL–CIO Building and Construction Trades Department’s Legislative Task Force. Abe worked closely with the Senate Environment and Public Works Committee, which I chair, in our efforts to promote clean energy jobs. He represented labor interests with passion and intellect and was a powerful advocate for the role of workers in moving the U.S. toward a clean energy future. Abe’s work was not limited to the U.S. Congress. He also worked internationally on efforts to control global warming, representing the International Brotherhood of Boilermakers in international negotiations under the United Nations Framework Convention on Climate Change. Abe received his bachelor’s degree from Sienna College in Loudonville, NY, and his master’s degree in public policy from the Rockefeller College of Public Affairs and Policy at the University of Albany. He was also a graduate of the Trade Union Program at Harvard Law School. Prior to joining the Boilermakers, he served as legislative assistant for Representative DOGGETT. As anyone who worked with him can tell you, Abe was an extraordinary person. Always full of cheer, he possessed a gift for finding common ground on tough issues, and he was taken from this world far too early. On Thursday, April 14, Abe passed away, leaving a loving wife, Sonya, and beloved daughter, Abigail. He is also survived by his parents Ray and Carol Breehey, sister Rachel Breehey Mollen, three nieces, and a nephew. Our thoughts and prayers go out to his loving family and many friends. The U.S. Congress and workers across the country have lost a tireless advocate, trusted colleague and friend, and Abe will be greatly missed. Although his life was short, Abe unquestionably left his mark and he made a difference in the lives of working people everywhere. He will serve as an inspiration for all of us going forward, and we will build on his important work to honor his legacy. I know I speak for all of my colleagues in the Senate in mourning the loss of Abe Breehey and paying tribute to the life of this vibrant and successful young man. I rise today to mourn the passing of Abraham Breehey, Director of Legislative Affairs and Special Assistant to the International President of the International Brotherhood of Boilermakers. A loving father, husband, and friend, Abe passed away, at just 35, on Thursday, April 14, 2011, at INOVA Fairfax Hospital in Virginia from brain tumor complications. Abe was born in 1976 in Binghamton, New York to Ray and Carol Breehey. He received his Bachelor’s Degree from Sienna College in Loudonville, NY, his Master’s Degree in Public Policy from the Rockefeller College of Public Affairs and Policy at the University of Albany, and graduated from the Trade Union Program at Harvard Law School. Prior to joining the Boilermakers in 2004, Abe served as Legislative Assistant for Representative Lloyd Doggett (TX-25). Throughout his life, Abe championed fundamental labor rights. He represented the Boilermakers on issues regarding the effects of energy policy and climate change on workers. Abe also testified in front of multiple U.S. Senate Committees and represented the Boilermakers in international negotiations regarding the United Nations Framework Convention on Climate Change. In addition, Abe advised the AFL-CIO Building and Construction Trades Department as Chairman of the Department’s Legislative Task Force. Abe was a leading voice in the labor movement and was widely respected by his friends and colleagues. He was known for his passion, his warm personality, and his negotiating skill to merge both ideological and political goals into a practical solution. Abe is survived by his wife, Sonya, his beloved daughter, Abigail, his father, Ray, his mother, Carol, and his sister, Rachel. My thoughts and prayers go out to the Breehey family. Abe was a good man who will be dearly missed by his family, friends, and the labor movement which he represented. I rise today to honor the life of Abraham Breehey, who recently passed away at the age of 35. I am honored that I have this opportunity to recognize this bright, caring and loving man. Through his role as the Director of Legislative Affairs for the International Brotherhood of Boilermakers, Abe proved to be a strong force within the labor movement. He was able to transcend political differences and generate consensus for many noble causes. Not only was Abe committed to improving the lives of all Americans, but he was also an outstanding leader in the fight against global warming and involved many unions in that effort. Abe’s dedication to the labor movement and the promotion of environmental stewardship has been an inspiration. Abe’s sense of civic duty even led him to testify several times before Congress, and was especially supportive of the Clear Skies Act before the Senate Environment and Public Works Committee. He is survived by his loving wife, Sonya and his daughter, Abigail. Mr. Speaker, Abraham Breehey touched many lives in his community and around our nation. Abe was a champion for progressive causes who loved the Grateful Dead and Phish and it is a privilege to recognize his life. He will be missed and I know I speak for the whole House in honoring the life of this dedicated and loving man. Mr. Speaker, I rise with deep sadness to honor the life of Abraham Breehey, Director of Legislative Affairs and Special Assistant to the International President of the International Brotherhood of Boilermakers. Abe passed away on Thursday, April 14, 2011, from complications related to a brain tumor and subsequent stroke. Abe, 34, was born in 1976 in Binghamton, New York and is survived by his wife, Sonya, daughter, Abigail, father Ray, mother Carol, sister Rachel, 3 nieces, a nephew, and his friendly dog Kesey. Abe received his Bachelor’s Degree from Sienna College in Loudonville, NY, and Master’s Degree in Public Policy from the Rockefeller College of Public Affairs and Policy at the University of Albany. He also attended the Trade Union Program at Harvard Law School. Prior to joining the Boilermakers in 2004, he served as Legislative Assistant for labor and other issues for my friend and colleague Representative LLOYD DOGGETT (TX–25). Abe was a leading voice in the labor movement, representing the Boilermakers on issues related to energy policy and climate change, and their impact on workers. He was widely respected for his passion, intellect, and ability to build consensus across ideological and political lines. He advised the AFL–CIO Building and Construction Trades Department as Chairman of the Department’s Legislative Task Force. He acted as a trusted friend and advisor to advocates for working families both on and off Capitol Hill. Abe had a genial nature, a ready smile, and was always a pleasure to work with. The labor and working families movement has lost a friend, a brother, and rising star. My thoughts and prayers go out to his family. I rise today with a heavy heart to honor the life of my friend Abraham Breehey, who passed away yesterday at the young age of 35. Abe was a champion for working men and women throughout his career. As Legislative Director for the International Brotherhood of Boilermakers, Abe was a leader among his colleagues representing the building and construction trades. He fought for labor and economic policies that would promote a fairer economy, and was an early leader in making the case that an energy policy to combat climate change would also be economically beneficial to those who, like boilermakers, are engaged in energy production. I got to know Abe before coming to Congress. We served together in Albany, where I was a Member of the New York State Assembly and Abe was a legislative aide to my Western New York colleague Sam Hoyt. We bonded over our shared love of music, and Abe gave me my first lessons on the guitar, a fact he never grew tired of reminding me about. Abe’s life was tragically cut short, a victim of brain cancer. He leaves behind a wife and daughter. He had much more left to give the people he fought for, but he had already given so much. His advocacy will be missed by the labor movement, and his warm heart will be missed by his friends. For my part, I will honor Abe by drawing inspiration from his work on behalf of those working in the building trades, and by redoubling my commitment to support cancer research. Abe was a gentleman, a professional, an optimist and a good, kind friend. He is missed. Mr. Speaker, today I rise to honor Abraham (Abe) Breehey, a devoted husband, father, son, and brother and to mourn him upon his sudden passing at the age of 34. Abe was the Government Affairs Director of the International Brotherhood of Boilermakers. Born in Binghamton, New York in 1976, Abe Breehey graduated with a Bachelor’s Degree from Sienna College in Loudonville, NY. He earned a Master’s Degree in Public Policy from Rockefeller College of Public Affairs and Policy at the University of Albany and went on to serve as a Legislative Assistant during the 107th Congress and 108th Congress. He joined the IBB legislative staff in 2004. Abe was a sagacious voice for labor, widely respected on Capitol Hill and throughout the ranks of his union for his intellect, passion and commitment. He had the innate ability to build consensus across political and ideological lines. On April 14, 2011, Abe passed from this earthly world to his eternal reward. He will long be remembered as a husband devoted to his beloved wife, Sonya and his treasured young daughter, Abigail. He is survived by his parents, Ray and Carol, his sister Rachel, three nieces, a nephew, and his loyal dog Kesey. Abe leaves behind a legacy of many friends whose lives were bettered for having known him. Mr. Speaker, during his lifetime, Abe enriched the lives of everyone around him. As we bid farewell to this vibrant man, I ask my colleagues to join me in mourning his passing and honoring his unwavering patriotism and legendary service to the working men and women of our community and our country. I was saddened to learn that Abraham Breehey passed away yesterday from a brain tumor and stroke. Abe was the Director of Legislative Affairs and Special Assistant to the International President of the International Brotherhood of Boilermakers. Abe also served as Chairman of the AFL–CIO Building and Construction Trades Department’s Legislative Task Force. Abe was only 34 years old. His death is a tragedy for his family and a loss for the working men and women of America on whose behalf he was so deeply committed. I share in sadness and reflection with Hawaii’s members of the International Brotherhood of Boilermakers, Iron Ship Builders, Blacksmiths, Forgers and Helpers, Locals 90 and 627. It is always sad when we lose a labor leader, especially one so young and with such promise. I have been told that Abe was a passionate advocate for working people around the world. He was well-respected in the labor community for using his sharp intellect to build consensus across party lines. Abe has testified in front of several U.S. Senate Committees, and he represented the Boilermakers in international negotiations on the United Nations Framework Convention on Climate Change. My thoughts and prayers are with the entire Breehey family and the U.S. labor movement. It is with deep sadness that I inform my colleagues that Abraham Breehey, Director of Legislative Affairs and Special Assistant to the International President of the International Brotherhood of Boilermakers, passed away yesterday, Thursday, April 14, 2011 at INOVA Fairfax Hospital, in Falls Church, Virginia, from complications related to a brain tumor and subsequent stroke. Abe, only 34 years old, was born in 1976 in Binghamton, New York. He is survived by his wife, Sonya and beloved young daughter, Abigail, his father Ray, his mother Carol, his sister Rachel, three nieces, a nephew and, of course, his dog Kesey. Abe received his Bachelor’s Degree from Sienna College in Loudonville, NY and Master’s Degree in Public Policy from the Rockefeller College of Public Affairs and Policy at the University of Albany. Prior to joining the Boilermakers in 2004, he served as Legislative Assistant for Representative Lloyd Doggett (TX-25). Abe was a leading voice in the labor movement, representing the Boilermakers on issues related to energy policy and climate change, and their impact on workers. He was widely respected for his passion, intellect, and ability to build consensus across ideological and political lines. Abe has testified in front of multiple U.S. Senate Committees and represented the Boilermakers in international negotiations regarding the United Nations Framework Convention on Climate Change. Abe also advised the AFL-CIO Building and Construction Trades Department as Chairman of the Department’s Legislative Task Force. And Abe is a graduate of the Trade Union Program at Harvard Law School. A staunch advocate on behalf of every Boilermaker member, Abe was a colleague and a friend to each of us. My thoughts and prayers are with the entire Breehey family. I hope they receive a small degree of comfort in knowing that Abe was so well liked and so well respected in his professional world. It was with great sadness that I recently learned of the passing of Abe Breehey. I rise to celebrate and commemorate his life, and to mourn his sudden and tragic death. I met Abe through his service as a dedicated advocate of the International Brotherhood of Boilermakers. He was a tireless presence in support of hardworking Americans, and he undertook his efforts with a passion and commitment that was admirable. At the same time, Abe was a truly genuine person; affable, funny, honest and a general pleasure to be around. He was able to bridge the divides we far too commonly find in politics today, and his intellect and determination will be sorely missed. I would like to extend my heartfelt condolences to Abe’s family, including his wife Sonya and daughter Abigail, his parents, sister and their broader family. I also extend my sympathies to his colleagues in the labor community, most especially those he worked with in the Boilermakers, President Newton Jones, Bridget Martin, among others. Along with my staff, I worked with Abe to move important issues forward, including strengthening our Buy American laws, protecting the rights of workers, and revitalizing American manufacturing. As I continue to engage in these issues, Abe’s memory will remain in my mind. His compassion, commitment, and dedication to these and other causes should motivate us all, and he will not be forgotten.